Tonight I saw a 70mm print of Alfred Hitchcock’s masterpiece, VERTIGO, at the Castro Theater in San Francisco. Although it’s my tenth time seeing the film, this was my first time seeing it projected on film with an audience. And boy was it good. I could talk about VERTIGO for hours, but I’d rather talk about my movie-going experience, because it was very, very special. 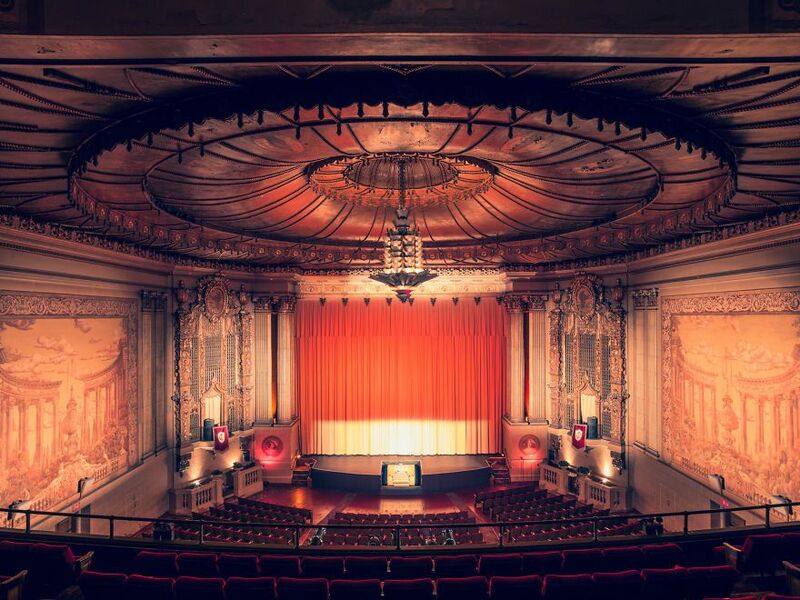 The Castro Theater is the oldest operating movie palace in the world, opened in 1922. Its interior is absolutely glamorous – there are golden corinthean columns surrounding the screen, rococo frescos, and amazing fantasy art work on the ceiling. The craftsmanship is stunning, as detailed and decorative as a Broadway house. It seats 1400 people, with an orchestra level and balcony. As I entered the enormous room, I felt all my anxieties from the day melting away. Ten minutes before the movie started, a spotlight illuminated an organ sitting below the screen. A man sat down at the organ, and the organ rose from the floor on a platform, about six feet in the air. The organist began playing amazing ragtime music, creating excitement and festiveness. It really perked everyone up. After some time the curtains began to close, and the music reached its crescendo and finale. The organ sank back down to ground level. The audience applauded and the lights dimmed. The curtains opened and the film began. The energy in the theater was palpable. As we make our new kind of theater experiences, I want our audiences to have on-boarding experiences like what I had at the Castro. Going to the movies today is so drab – assaultive trailers, advertisements and monotonous black interiors fail to prepare us for the upcoming entertainment. I wonder how we can lure audiences into a dream world before the show begins, and make our experiences evoke the magic and mystery of a time long past.